These are just some of the many highlights on this tour through Vietnam. From the historic sites to the gorgeous scenery, this Vietnam tour designed for savvy, value-minded travelers is a vacation of a lifetime! Sightseeing vehicle to/from and in Sapa. Private, deluxe, air-conditioned motorcoach while touring. HANOI, VIETNAM. Welcome to Vietnam’s capital city, an attractive, laidback city with charming French-Colonial-style buildings. Hotel rooms are available for a mid-afternoon check-in. HANOI–SAPA. Today, transfer to the hill-station town of Sapa known for its mountain scenery, rice fields, and colourful ethnic minorities. This afternoon, join a walking tour of this small town and visit the LOCAL MARKET. SAPA–HANOI. Return to Hanoi today. The remainder of the day is at your leisure. HANOI. Today’s included sightseeing tour takes you to many of the city’s highlights, including the TEMPLE OF LITERATURE, a peaceful series of walled courtyards and gateways, and ONE PILLAR PAGODA, designed to resemble a lotus blossom. You will also see Ho Chi Minh’s stilt house, Hoan Kiem Lake, and the fascinating network of alleyways and shop houses that make up the Old Quarter. This evening, enjoy a performance of Hanoi’s famed WATER PUPPETS. HA LONG BAY–HANOI–PHONG NHA-KE BANG NATIONAL PARK. Return to Hanoi this morning and fly to Dong Hoi. From here, journey inland to remarkable PHONG NHA-KE BANG NATIONAL PARK, a UNESCO park littered with beautiful jungles, caves, and underground rivers. Your lodging tonight is a charming farmstay at the base of park. PHONG NHA-KE BANG NATIONAL PARK–HUE. Drive to Hue, stopping at the DMZ bridge en route. Upon arrival in the imperial walled city of Hue, visit the FORBIDDEN PURPLE CITY, modeled after Beijing’s famed Forbidden CIty. During your visit, you will see Thai Hoa Palace, the Halls of the Mandarins, and the Nine Dynastic Urns. HOI AN. Start today with a CRUISE on the Thu Bon River, passing unspoiled countryside. Then, a leisurely WALKING TOUR through Hoi An Ancient Town brings you to the Japanese Covered Bridge. The remainder of the day is at your leisure. 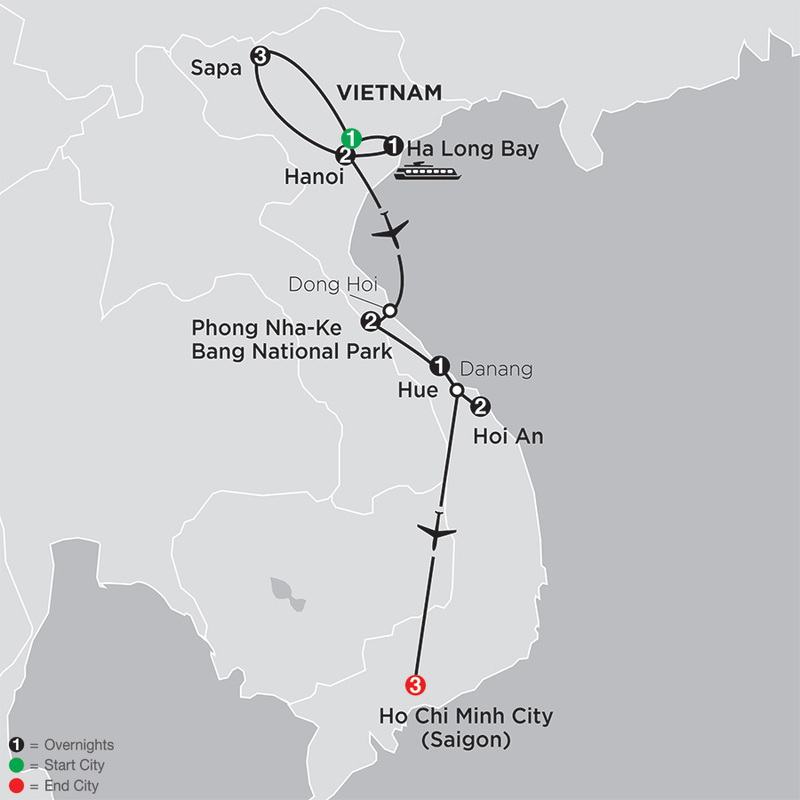 HOI AN–HO CHI MINH CITY. Enjoy your morning at leisure. This afternoon, fly to Ho Chi Minh City, Vietnam’s largest and most vibrant city, packed with timeless traditions. HO CHI MINH CITY. Today’s sightseeing tour takes in Dong Khoi Street, the main shopping thoroughfare, Notre Dame Cathedral, and the Central Post Office. Afterward, visit the REUNIFICATION PALACE and the WAR REMNANTS MUSEUM, as well as the Chinese district. HO CHI MINH CITY. CU CHI TUNNELS EXCURSION. Today, visit the CU CHI TUNNELS, an extraordinary network of tunnels more than 120 miles long that was used by the Viet Cong as a hideout and secret village during the war. See secret trapdoors, underground kitchens, living areas, and meeting rooms. If you are feeling adventurous, you may enter and explore the deep, narrow tunnels. HO CHI MINH. Your tour ends with breakfast this morning. "Hung graduated from Hanoi National University in 1998 after studying English. He started his career in tourism shortly thereafter and has over a decade of experience leading tours through Vietnam. He possesses comprehensive knowledge of Vietnam, with interests extending to politics, history, and cultural traditions. His interest in photography and local landscapes makes him the perfect guide for snapping the ideal shot."